If you’ve been here for a while, you’ll know that we home educate our boys. I wrote about us starting Henry’s home education journey and there’s also a post which talked about whether to send the boys or not. Obviously, as the boys aren’t having a “formal education”, it’s important that we have good resources for them at home. Which is why I was really excited when Edu Prints Plus got in touch with me. Edu Prints Plus promise to provide you with wall art to inspire your child. My biggest home education philosophy is to let the boys lead us for now. We don’t sit down at the table and read and write all day. Instead, they watch documentaries, colour and play as all 4 & 2-year-olds should do, regardless of whether they’re in school or not. Henry’s always been interested in numbers but recently, his interests have shifted to geography. He’s currently learning the capitals of countries. We have a world map up in his bedroom as well as a poster which shows him all the flags of the world. He’s shown a big interest in these so we were on the lookout for more posters or prints to hang in his bedroom. As Henry is only four, we went for the two times table. There is a print for the one times table but Henry is confident in his counting which is basically what the one times table is! It’s landscape with a crocodile in the shape of a number 2 with the table down the side. The background is a lovely dark blue, making it perfect for all bedroom styles and decor. Next, I had to choose the vocabulary print. There are so many different words you can choose such as big, happy and pretty but I went with laugh. Our home is full of laughter so it seemed appropriate. 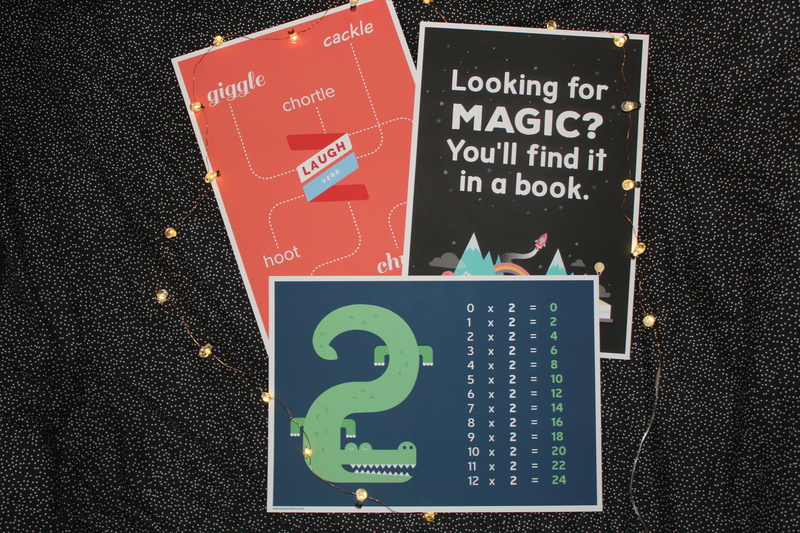 These prints are designed to broaden your child’s vocabulary and teach them different words instead of them using the same ones all the time. This one is portrait and is a pinky/red colour. This was the print I had the most difficulty in choosing. I would have every single one of them around my house because they’re all lovely. “Normal is overrated” and “Do the right thing, even when no one is looking” were on my shortlist but in the end, I went with “Looking for magic? You’ll find it in a book”. We’ve read to the boys every day since they were born and even when I was pregnant with them. Reading is really important in our house so it seemed like the best one to get for their room. I am really impressed with the quality of the prints and would definitely order from them again. They’re glossy, a good size (A3) and don’t feel flimsy in the slightest. One of these prints would make a perfect present for a child you know, whether it’s for their birthday or Christmas. If you buy four of these prints, you’ll get the fifth for free which is perfect if you don’t know which one to buy! Disclaimer: I was sent all three of these prints free of charge from Edu Prints Plus in exchange for an honest and non biased review. All of the opinions and views represented in this post are my own. I haven’t been influenced in any way.